…so I saw this CSI challenge 107 and it just happened to remind me of my grandmother. She passed away recently (MLK weekend), and the colors just said to me, “This will work.” My grandmother’s favorite colors were pink and purple, and mine is yellow. So mix that with some nice neutrals and I knew I was going to scrap about my grandma, or Grammy. I apologize for the slight blurry effect. Sunlight has been hit and miss, so I had to adjust my camera settings. So I did a lot of stuff, obviously. 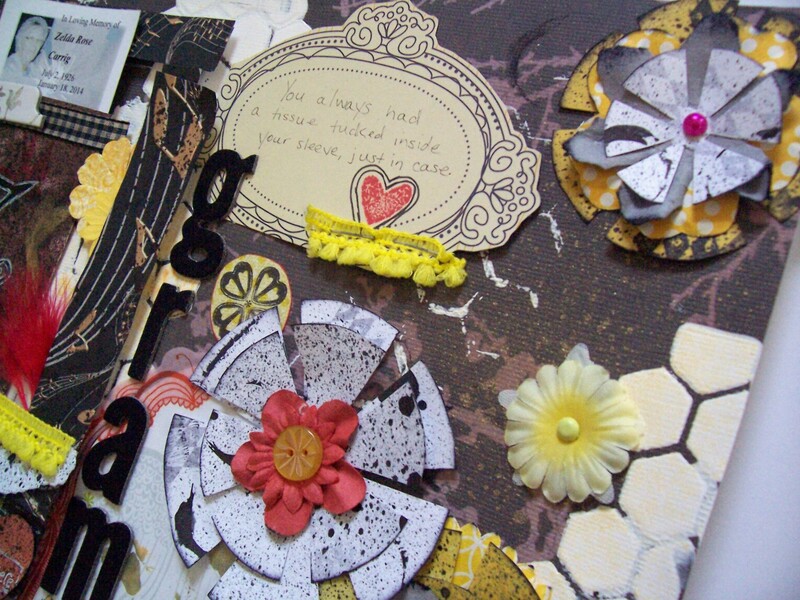 I chose a background paper from my DCWV Far East stack, which is black with flower branches. Grammy loved flowers, and they were the right shade. 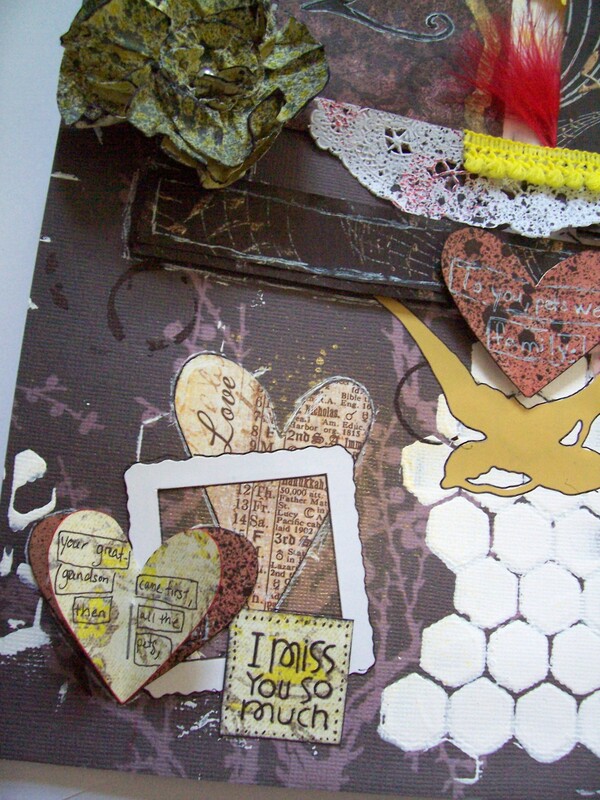 I gessoed through my Heidi Swapp honeycomb stencil and while it was still drying, I sprayed my Heidi Swapp Color Shine in Mustard in different spots. I used my Tattered Angels black glimmer mist, Color Shine in Mustard, my Rangers Archival Jet Black stamp ink, and my Tim Holtz Distress Ink in Festive Berries A LOT. I used several different stamps from different stamps. 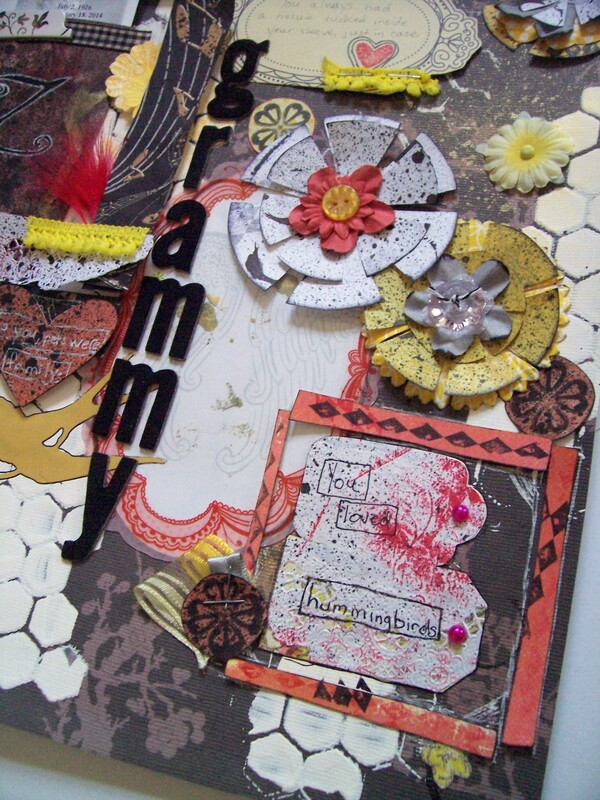 The four leaf clover flower (my grandmother was Irish and married an Irishman) is from a Bo Bunny set, the red heart from a Studio G V-Day set, the harlequin pattern stamp from Tim Holtz, and the small reddish bird on the top left and black branch with flower from a Ditto stamp set. I did a bit of frames and lots of flowers. 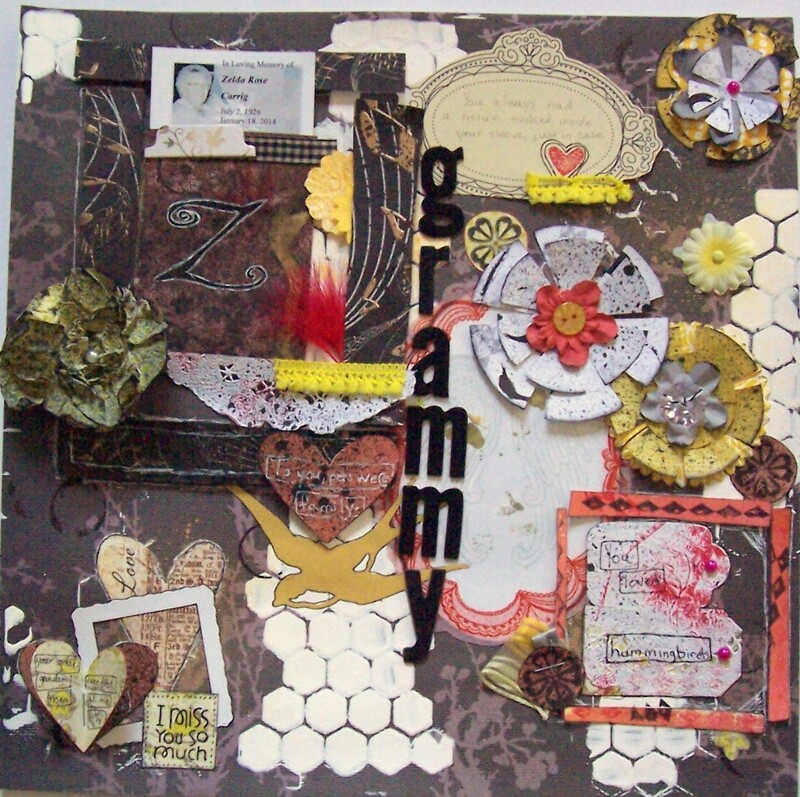 I used my mists and stamps on white and butter yellow cardstock and cut out flower shapes (hand-drawn). I also used some flowers from my stash to layer them up. I used little pearls in white and dark pink for a couple flower centers and to accent the two journal tags in the bottom right corner. I added some ribbon, a transparency frame with a die-cut of angel wings that I cut out and added a touch of my Mustard spray mist too. My grandmothers also loved hummingbirds, hence the red feather. 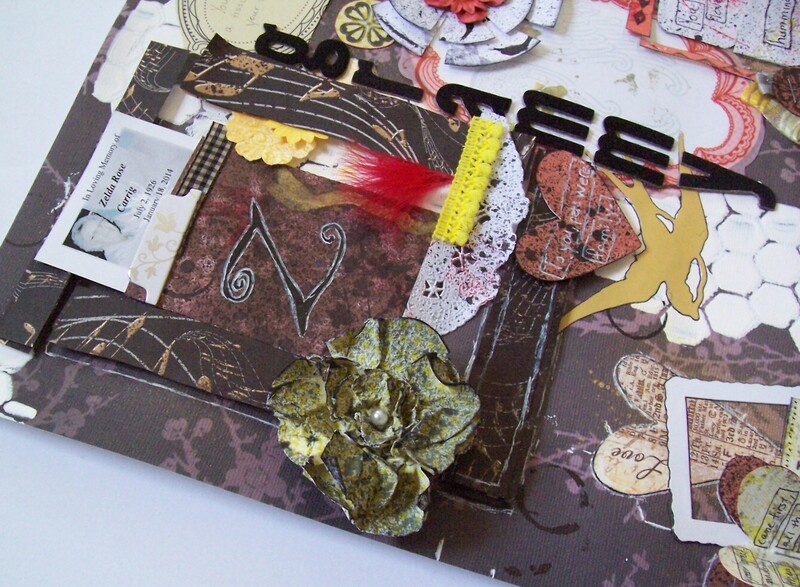 I used several hearts in various spots, including two journaling spots. The card poking out of the top pouch is a prayer card from her service. The “Z” on the pouch is for her name. I freely admit that I have some guilt over her death, namely in the sense that I hadn’t physically seen her (except Skype) in the last several years. Unfortunately, finances weren’t the greatest, and life kept throwing stuff at us, so I hadn’t gotten to visit home for a number of years. So yeah, I really miss her.